Snow is slowly falling outside my window today just as it did yesterday although yesterday the snow had melted by this time. This has not stopped the spring birds from flitting from tree to tree. Some birds are a ways off but my Panasonic Lumix DMC-ZS19 camera, which has a 20x zoom, is able to see them better than my binoculars. Still, the pictures aren’t the clearest. Time to use a tripod or upgrade to a new camera with a better zoom lens sometime soon. One of the first birds to come around were the house finches. 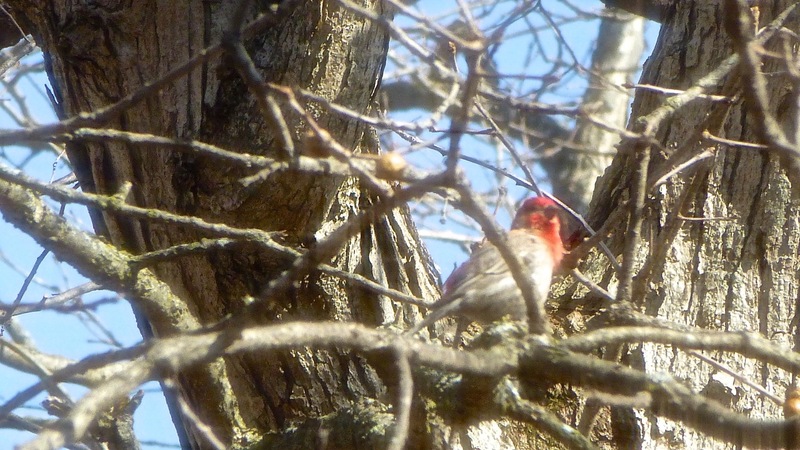 Below is a picture of the male house finch. He’s so pretty with his red colored head. 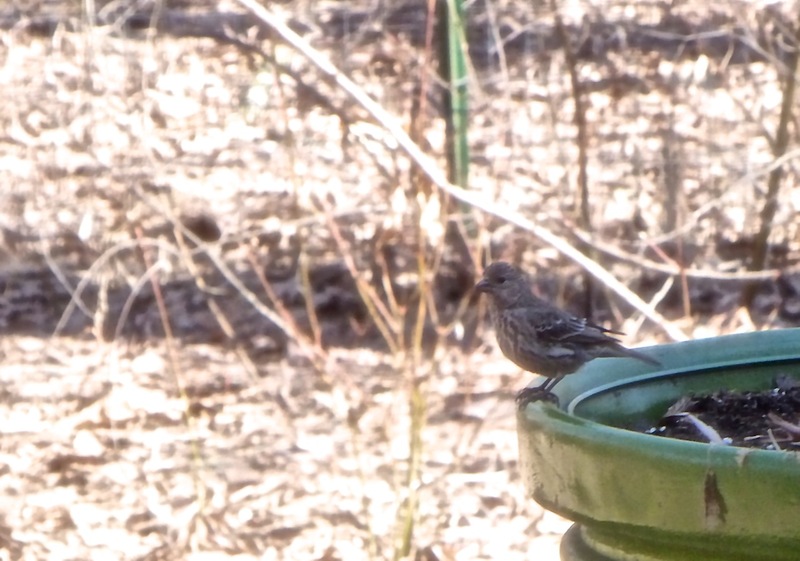 The female house finch was not far behind but she has no pretty coloring to her. Quite opposite the human species where women tend to “dress up” more than men do. I haven’t been able to tell if these two finches are the ones feeding at our new bird feeder that we have hanging over the deck. 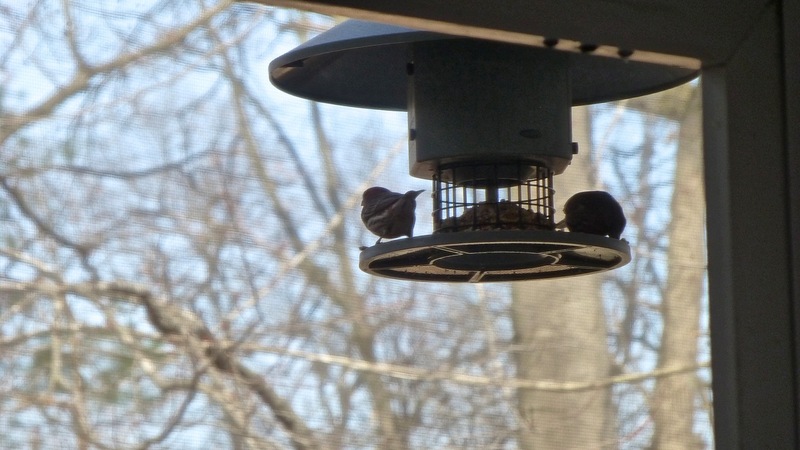 The feeder is too close to the house and whenever there is movement inside the birds fly away. We’ll have to relocate this feeder so I can take better pictures. The birds do look similar to the house finch, don’t you think? Whenever the sun is out and I see a large “shadow” on the ground, I usually look for the red shouldered hawk. He has quite a voice on him but when he reaches a branch, he sits very quiet and doesn’t move for awhile. He’s looking for his prey — small mammals. Eeek! I wonder if they eat small cats as one of our neighbors is missing one. Click here to get to the website where you can listen to the sound he makes. It’s quite unique and different from other hawk sounds. 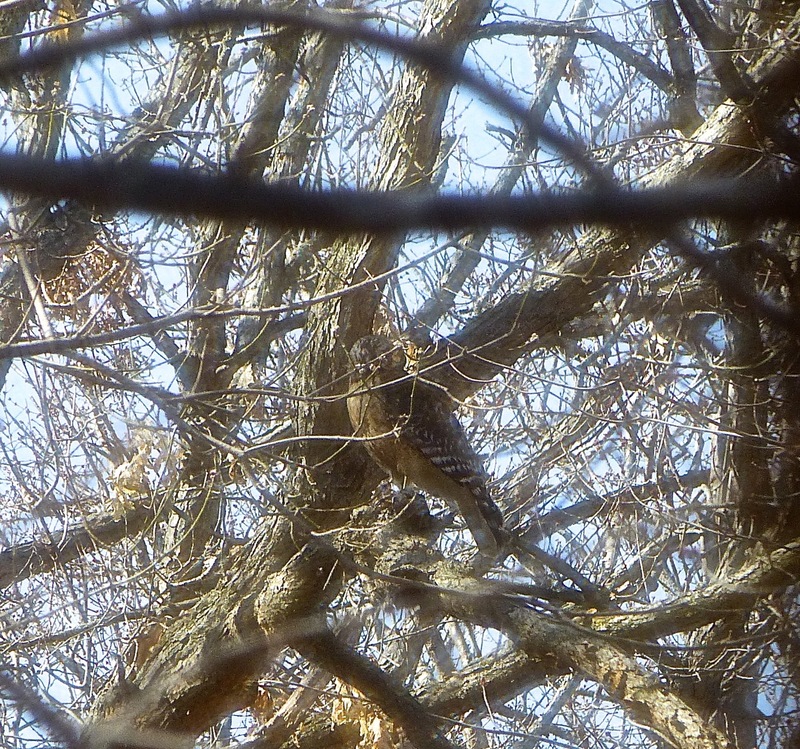 The red shouldered hawk was very hard to see as his coloring is very similar to the trees. My mother-in-law gave me a book called Birds of Minnesota and I have been using it to identify these birds. It is quite useful.